It's possible to be both a lone wolf and a team player. Image via Steam Workshop, by Lord Rich. What is the lurker supposed to do? Release your inner Ethan Hunt and bring out your sneakiest plays: it’s time to talk about the lurker. Compared to the roles I’ve covered so far (support and entry fragger), lurker is the most distinctive in terms of what you’re supposed to do and how to get it to work within a team. It would be easy to say that the lurker is the player who sneaks around the map on their own trying to backstab people. In a sense that’s true, but there’s so much more to it. The lurker is supposed to wander off by themselves and either secure kills or stall the opposing team’s defenders’ rotation over to the site where the main attack is taking place. They should also scout ahead to let the in-game leader know whether it’s a good idea to go for the intended execution or not. Let’s say they’re in apartments on Inferno (a moment of silence for our beloved and figured-out map) and they can hear that there’s a CT on short as well as one in pit after you’ve taken control over banana. In this instance, they know that the rotation is going to take a while and that it’s probably wise to try to take the B-site. The lurker is also in a great position to kill the CT in pit once that guy realizes that the terrorists are swarming B.
Alternatively, the lurker could go down to boiler room and try to kill the player on short in order to stay closer to B so that they can assist his team during the post-plant situation. There’s a lot of decision-making involved when you lurk: decisions that can either make or break a round. Let’s say the lurker decides to go for the kill in pit but the CT manages to get out safely. Then our lurker is in a bad situation and can’t be of much help for their team. 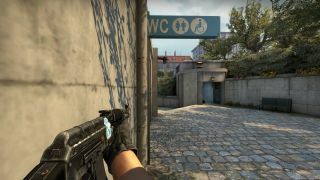 On the other hand, they might secure the kill and put some pressure on defenders in CT spawn, making it a lot more difficult to retake the site. Who should be a lurker? I’d say that there are two primary qualities that a good lurker needs: creativity and good communication. A creative lurker can come up with plays that most other players wouldn’t even consider. Coming up with a play involves good reads of what your opponents are likely to do as well as understanding what they may or may not expect. I’d say your lurker should be a player who trusts their instincts. When I ask the lurker on my team how he came up with a certain play, he often replies with “I don’t know, it just felt right”. Lurking is a highly intuitive endeavor. It takes time to get it right, so don’t beat yourself up if you’re new. The only way to develop this skill is through experience. The other part, communication, is probably the main reason why you want a lurker on your team in the first place. Your lurker needs to be able to assess the situation and provide good information. If they can’t hear nor see a CT in a position where they expect a CT to be, they should alert the rest of his team as they might be about to walk straight into a meat grinder. Remember that knowing where the defenders aren’t positioned will help you figure out where they are. Also, it doesn’t hurt if your lurker is a person who watches a lot of demos in order to learn how top players generally react to certain plays. How does the B-player on Mirage generally react to a smoke strat over at the A-site? Is it possible to categorize players in different groups? The players who tend to rotate early, players who stay for too long and players who “half rotate” over to a more defensive position closer to the market area? If so, will that knowledge help you identify what kind of player that B-defender is in a live game? I think so. Study the game and tendencies and you’ll have a better chance of making good decisions on the fly. It’s also important that your lurker is individually skilled and can hold their own in a fight, as that’s what they’re supposed to do most of the time. This round was played during the grand final of Dreamhack Masters in Malmö, Sweden a few weeks ago. Christopher ‘GeT_RiGhT’ Alesund from Ninjas in Pyjamas starts off the round by going off on his own towards B. He jumps down to lower tunnels and is lucky enough to find Ioann ‘Edward’ Sukhariev out of position on catwalk. As Edward goes down, the rest of NiP know that there’s one less CT remaining on the A-side of the map. GeT_RiGhT proceeds by smoking off mid doors. At that point Na’Vi have no idea how many players are around the mid area. As a result, they can’t really start to rotate away from either site. Two flashbangs and a sneaky play through the smoke later and GeT_RiGhT picks up his second kill: Ladislav ‘GuardiaN’ Kovács. After that kill, he waits for a second or two but no one tries to trade off the kill from the B-side of mid, suggesting that the B-player might have pushed tunnels for information. I have no way of knowing for sure, but I think that the smoke in mid served two purposes. The first one and the most obvious one is that it allowed GeT_RiGhT to go for the sneaky play with the flashes. The second one was that it, in a way, forced Na’Vi to go for a peek in tunnels for information, because at that point they couldn’t know where NiP was going to attack. Knowing that there was a possibility that they would peek and find that no one was there made Christopher realize that there was a chance that the B-player was going to attempt to flank him. His flawless read of the play secured his third kill of the round as he managed to pick off Egor ‘flamie’ Vasilyev. After that his job was pretty much done. He decided to stay in lower tunnels and make sure the last CT couldn’t push mid doors. This time he missed the fact that Daniil ‘ Zeus’ Teslenko pushed short in an attempt to save his armor and CZ75-Auto. It’s easy to see what an impact his lurk play had on the round. Not only did he kill three players, he also made sure that the defending players couldn’t know where the main push was going to take place. If you’ve decided that you want to be the lurker on your team there’s a lot of work to be done. The main area that I think you should focus on is your gamesense. Watch a lot of demos from your own games to find out how players on your level react to the things you do. How do the players on a certain site generally react to a flashbang thrown in a certain spot at a certain time. If you notice a pattern you should try to figure out what triggered the response. The best way to learn these things is to play a lot of games. Preferably against other pre-made teams, so that you know that they will communicate. It’s even more important that you focus and try to figure out how a specific opponent plays during the actual game and how you can use that knowledge to your advantage. If your team goes for an A-push and you throw your flashbangs and a smoke towards B, how long did it take for the B-players to get to A? Is it possible for you to play in a certain way to trick them into doing what you want them to do? Because of the nature of your role, you should spend a lot of time on deathmatch servers. It’s crucial that you get good at winning those aim duels. It’s like that old Bruce Lee quote that’s been cited almost too many times: “I fear not the man who has practiced 10,000 kicks once, but I fear the man who has practiced one kick 10,000 times”. If you spend more time working on the basics of the game than your opponent, you give yourself a greater chance to come out on top of any given situation. When you play games for practice purposes you should try to mix things up as much as possible so that, over time, you build a solid repertoire of plays that you can use in different situations. However, it’s important to remember that when you play matches you can lure your opponents into a false sense of security by going for the same exact play every single round. Usually those plays involve a smoke and two flashes. It’s important that you’re able to stay alive once they know what you’re up to. After a few rounds they might think that they’ve figured you out and when you throw your utility grenades they “know” that you’re alone. All of a sudden you show up with your entire team and the CTs haven’t started to rotate in time. GeT_RiGhT might not have been the player who came up with that style of play, but he sure was the one to make it famous. He’s able to pull it off on a professional level because of his raw individual skill. Like I said, put a lot of time into practicing the basics. As with all roles in CS:GO it’s important that you watch the pros play if you want to improve. First of all, you should try to answer the most basic of questions: what exactly is this player doing? By keeping that question in mind you’ll look for the information that’s actually useful rather than to just notice the big kills and wish that you could pull off stuff like that. Once you’ve answered that question your next one should be: why are they doing what they’re doing? Here’s where it gets tricky. Look at what their teammates are doing and how the lurker’s plays help them. Lurkers rarely just lurk for the sake of lurking. So, who should you watch? One obvious choice is GeT_RiGhT, the best lurker in the history of CS:GO and Counter-Strike in general. Every CS player can learn things from him. The next guy I recommend you to watch is Spencer ‘Hiko’ Martin from Team Liquid. At the moment he’s the strat caller for his team, so if you watch recent games you’ll notice that he plays more of a support role than before. Take a look at a few demos from before the MLG Columbus Major and you’ll find some useful stuff. His style is a lot more passive than GeT_RiGhT’s, but he’s really good at finding kills. Especially towards the end of rounds. You can find both recent and older demos over at HLTV.org. Click ‘Events’ and under ‘Past events’ you’ll find a link to their massive and awesome archive. There you can select specific events you want to watch and you’ll have access to an almost infinite number of demos. Study hard. Play harder. Get to where you want to be.